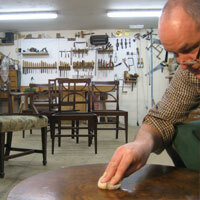 Conservator/restorer - David Burton has over 20 years of commercial furniture conservation/restoration experience. He gained an HND (distinction) in furniture studies and graduated from West Dean College with a Graduate Diploma and Post Graduate Diploma (distinction) in furniture and related objects conservation. David has a (conservation studies) Masters Degree and is a member of the Institute of Conservation (UK) and the International Institute of Conservation. Our other restorer Alex also graduated from West Dean College with a College Diploma and a Professional development Diploma in furniture and related objects conservation. Hampshire Antique Restoration is at your service.